Genuine mid-engined exotics don't tend to wear German badges. Yes, there have been a few such anomalies down the years, but they rarely received the acclaim of their Italian counterparts. 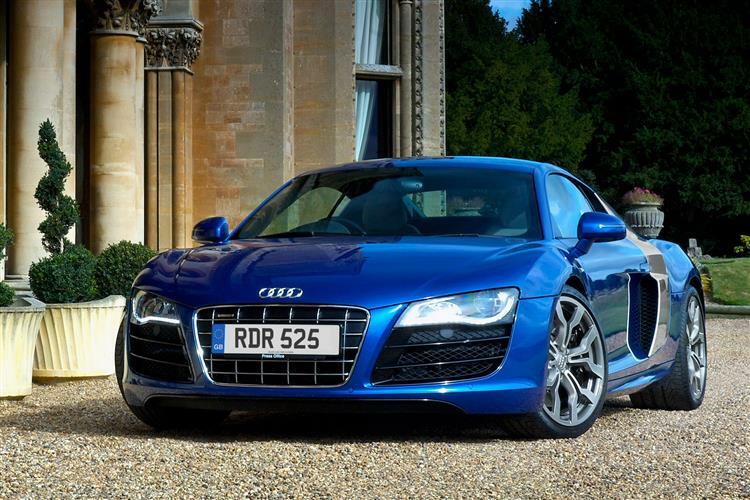 Here's the car that broke the mould, the Audi R8. Here was proof that you could buy a car with the charisma and presence of a Lamborghini and the engineering of, well, of an Audi and in V10 guise it has the performance to match. If you've been put off buying a supercar in the past because of their fragility and flakiness, here's where you should be looking to buy used. Improving on the V8 model was a tall order and the R8 V10's weight distribution has shifted a couple of percentage points towards the rear whilst retaining the same torque split for the four-wheel drive system. The interior gets Nappa leather and satellite navigation as standard, while the exterior receives carbon sideblades, a big rear diffuser, all-LED headlights, twin ovoid exhausts, 19-inch alloy wheels and discreet V10 badging. Given that most V8-engined R8s have been heading out of dealerships specified to a point somewhere north of £90,000, the relatively modest premium Audi ask for the V10 looks money well spent. Make sure the car is in perfect condition. There's no reason why it shouldn't be, as it will be within warranty, but any dents, scratches or interior damage will knock values hard. It's a buyers' market right now. Check for crash damage at the front, and inspect the tyres for signs of uneven wear. The majority of cars that crop up on the used market will have been equipped to well above standard spec. Typically, there will be around £10,000 worth of extras and demand for the R8 is such that sellers will be able to reflect this outlay in the asking price. 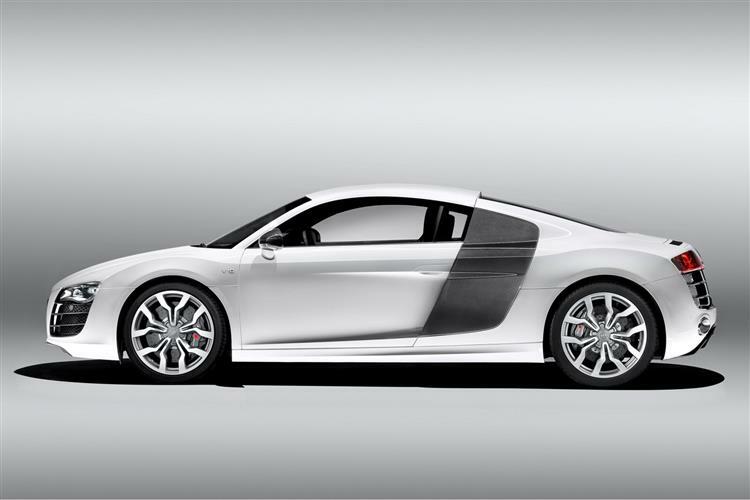 Avoid outlandish colour combinations and the R8 should be a sound bet by supercar standards. The running gear is tried and tested and shouldn't throw up too many problems. Otherwise insist on a full service record. 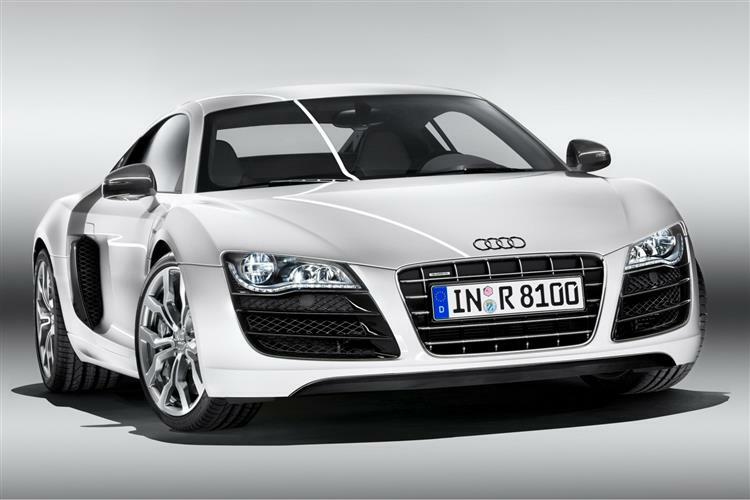 (approx prices for a 2011 R8 5.2 FSI coupe - ex Vat) Tyres are around £375 a corner and you'll need to spend around £600 on a replacement clutch assembly, while brake pads are around £150 for the front pair and £100 for the rears. Door mirrors are £250 per unit. The engine you probably know about. It's much the same powerplant that's plumbed into the Lamborghini Gallardo LP560/4, but so as not to cause much arm waving down at Sant'Agata, this direct injection engine is detuned to a mere 525bhp where the Lambo gets the full-strength 552bhp unit (and charges buyers an additional £45k for the privilege). 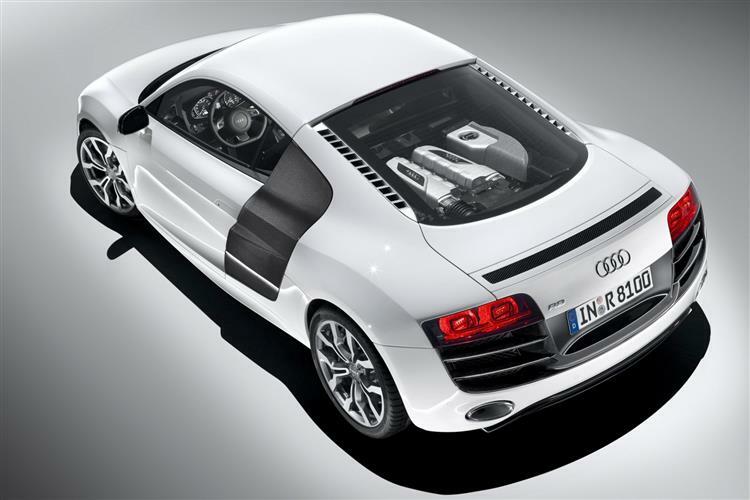 That's still enough power to catapult the all-wheel drive R8 to 60mph in just 3.7s on the way to a 196mph maximum. In terms of price and performance, it's a very close match for the Porsche 911 Turbo, but when it comes to providing a thumping soundtrack, the Audi wins every time. The V10 might not be the most musical of engines, but it's undoubtedly purposeful and with huge reserves of torque, it's not an engine that you'll need to constantly keep on the boil. A six-speed gated manual box is fitted as standard or there's the option of the R-tronic paddle shifter. This isn't a slick twin-clutch affair but does a good job of preventing the car bouncing off its rev limiter. Despite the adulation poured on the rather tedious clackety-clack open-gated manual, I really rather warmed to the Lambo-derived R tronic with its aggressive Sport mode and surprisingly adept 'automatic' system. 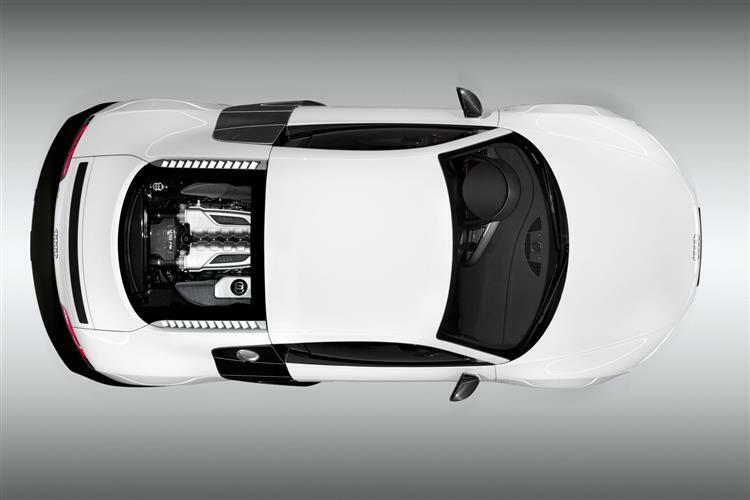 Arrive mid-corner at speed and the R8's handling balance gives you options. It's softer-edged than its distant cousin, the Lamborghini Gallardo, but more benign, offering plenty of feedback as to what's going on at the tyre contact points. Ride, handling, brakes, visibility, and engine note all get the thumbs up. In fact, it's hard to pinpoint one aspect of this car's dynamics I don't like. Perhaps the steering could use a little more weight. That's about it. 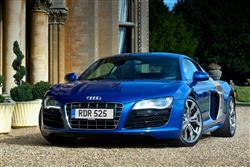 The Audi R8 is a hugely desirable thing. In V10 guise it's harder and faster with a very different personality to the V8. Is it a better car? That's a tough one to answer. If given the choice, I'd always opt for the sweet-natured, tuneful and tractable V8 model, but drive the two back to back and you can see where the V10 just takes chunks out of the smaller car. It's just that much brawnier and deep-lunged. Effortlessly rapid and with a darker personality, it feels a more serious piece of kit. As a used buy it makes a lot of sense as the steepest part of the depreciation curve is done and dusted on earlier models and bargains can be had as buyers offload cars that have just come out of warranty. Searching out a decent warranty continuation plan is always a good idea but look at the small print very carefully. This is a complex and expensive car. Otherwise, there's a lot to recommend. Supercar ownership without the typical nightmares? 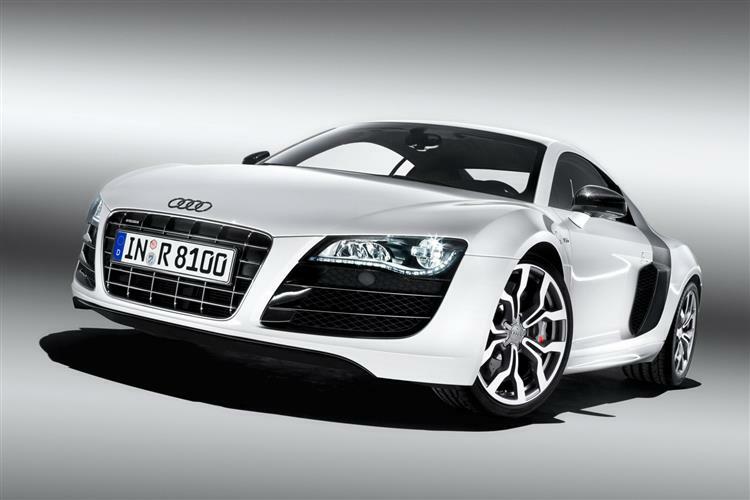 Why do you think the R8 has been such a runaway success?